Going into the preseason, all of the attention at New York Jets camp was focused squarely on Mark Sanchez and Tim Tebow. Following the first couple preseason games — and, in particular, Saturday’s 26-3, seven-sack drubbing at the hands of the New York Giants — the spotlight hasn’t exactly shifted, but it has broadened to include a wider swath of suspects. Namely, it’s been on the offensive line, and even more specifically, whoever happens to be at right tackle. Wayne Hunter got the first crack on Saturday and was promptly abused by Jason Pierre-Paul. His backup, Austin Howard, didn’t fare much better. If the Jets have any hope of success — regardless of who their quarterback is — they need better play along the offensive line. Saturday night was an example of the preseason problem of hodgepodge lineups that haven’t spent much time together. As the game wore on, the Jets routinely failed to pick up very simple blitzes, and the result was sacks, hurries, and, according to some reports, an extremely frustrated Tim Tebow. The offensive lineman also has to answer an LSAT question every play. If five men are arranged so, and another four men are sent to advance past them in any combination possible, but also perhaps with one, two, or sometimes three additional men sent along with them, then your quarterback is sacked. I’m sorry, that took too long, and your quarterback is dead. Were you terrible at those chair/seat/permutation questions on standardized tests? Most people are, and that is one of the reasons five men struggle to block four men consistently in football. This preseason, I haven’t yet seen the Jets successfully accomplish that task. As an example, let’s look at the play that apparently enraged Tebow, a third-and-10 where his former Florida teammate Will Hill came unblocked off the edge and drilled him. The Jets lined up with four wide receivers — two to each side — and running back Joe McKnight to Tebow’s left. The Giants ran a very simple “fire zone” blitz, which is a type of zone blitz that has three deep zone defenders and three underneath ones. This leaves five defensive players to rush the quarterback: Here, they’re the Giants’ four defensive linemen and Hill, who lined up over the slot receiver and feigned man coverage before the snap. The Jets ran a common third-down play in which the outside receivers sprint downfield to draw the defense while the inside receivers run past the first down marker and turn around. It’s nothing fancy, but it’s also not a bad strategy, including against a fire zone blitz. The problem is that with no receivers breaking off their routes short, the offense simply must block the four, five, or six Giants defenders who might rush. This did not happen, as Hill came completely unblocked off the edge. The blitz itself was entirely straightforward except for one important element: Hill was the defensive back lined up away from the running back. The Giants repeatedly blitzed an outside defender away from the alignment of the Jets’ running back, a clear message that they were attacking a particular aspect of the Jets’ pass protection scheme. Without knowing exactly what the Jets’ rules are, I can’t say exactly what went wrong, but there are basically three ways to account for this kind of tactic from the Giants. First, the Jets’ offensive line could be assigned to block the interior of the Giants’ front — the four defensive linemen and the middle linebacker. The running back, although he’s lined up to the left, would be told to block the extra rusher from either his left or his right. 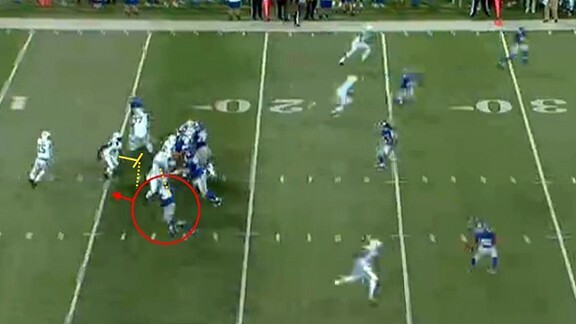 In this case, it was the running back, McKnight, who failed to block Hill. 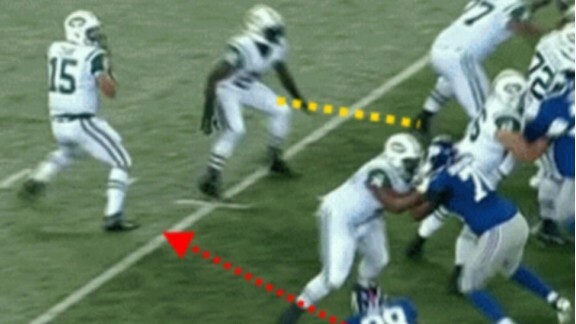 The second possibility is that if McKnight was only responsible for defenders to his side — Tebow’s left — the right side of the Jets’ offensive line should’ve been able to “slide” to the right to pick up Hill coming off the edge. This is known as “half-slide” protection, and while it requires significant coordination by the entire line, it is also the most popular protection scheme in the NFL right now. This leaves no excuse for repeatedly blowing it. Either way, whichever of the two options the Jets employed, it’s clear from the image below that neither tactic was done effectively. The third possibility is that the slot receiver on Hill’s side should have shortened or otherwise altered his route so Tebow could throw it to him more quickly than originally anticipated — a “hot route.” Although it’s a possibility, in this circumstance I find it unlikely. Most teams “turn off” their hot routes on third-and-10 because throwing a five-yard pass on third-and-10 plays into the defense’s hands. Regardless of who made the critical mistake, it’s pretty evident that Hill’s sack was not part of the game plan. Given the erratic quarterback play, question marks in the running game, and injured receivers, we knew the Jets had a lot of problems. Little did we know that lack of “synergy” might be their biggest one.